-- Every week a new Karin Tiffany menu appears on the blackboards. Every night, customers arrive early, before the kitchen opens, to stake out a table or a barstool in the Fells Point restaurant. 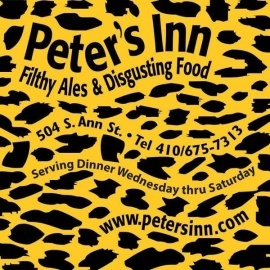 Peter's Inn is the kind of place a Baltimorean points to and says, "Now do you see why I love this city?" 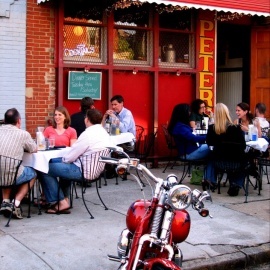 "And finally, hit Peter’s Inn, in a tiny row house with a bright-red door, for big flavors like the wild rockfish tacos with crème fraiche and the veal cheek ragu."